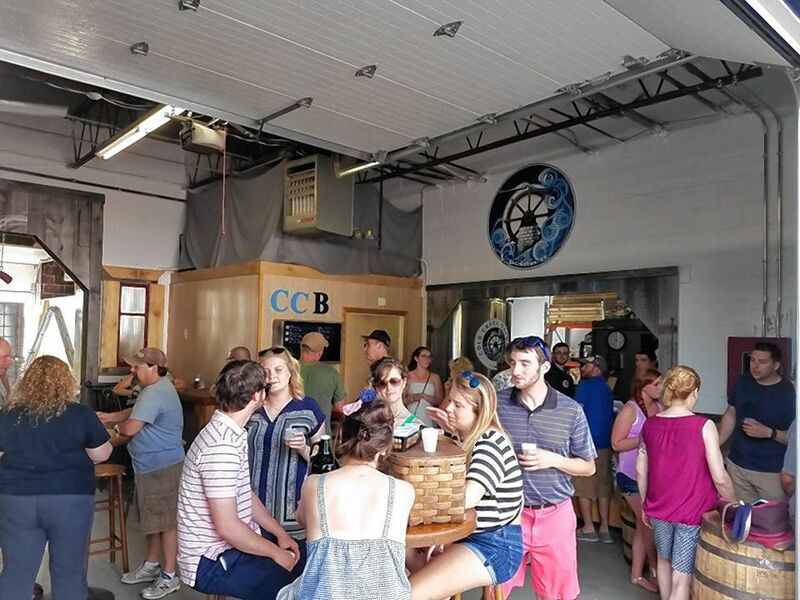 Behind a roll-up garage door in Ellington, CT, Cold Creek Brewery is cranking out some robust and creative beers. Facebook photo. 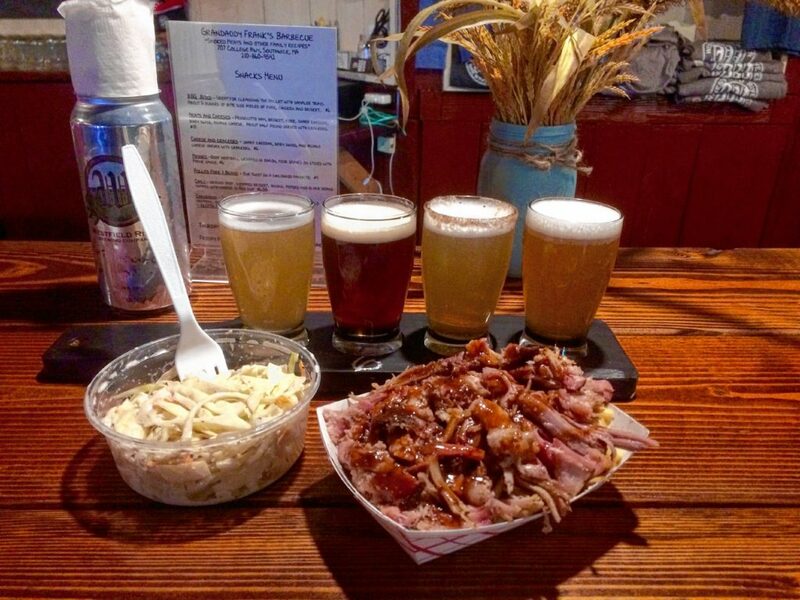 Westfield River Brewing Company in Southwick boasts barbecue pairings. Hunter Styles photo. Most night owls are easy when it comes to shifts in ambience, but I can’t say that many of us thrive under fluorescent light. That might have been why, on Wednesday afternoon, my editor found me sighing heavily at my desk. She encouraged me to take a break from the blinking cursor on my screen and hit the road for a few hours. Didn’t I have a Beerhunter column to write? Why yes, as a matter of fact, I did. And ever since my visit last month to craft breweries in the Hartford area, I’d been eager to get back down there and tie up a few loose ends. One, in particular, felt under-explored: the brewery landscape along the southern border of Hampden County and the northern border of Hartford County. It was last month’s visit to Powder Hollow Brewery in Enfield, in particular, that drove this home for me. A resident of Springfield could jump in the car and be here, sipping beer and watching hockey in the Powder Hollow taproom, in 20 minutes — faster than they could make it to any better-known craft beer bar in Northampton. Not wanting to leave my Hampden County craft beer readers hanging, I hit the dusty trail, bringing with me an uncommonly large appetite. That’s because I was craving some fast, easy Southern barbecue, and the first stop on my circuit serves up precisely that: Westfield River Brewing Company in Southwick. November marked the two-year anniversary of this brewery moving from Westfield into the huge red barn on College Highway in Southwick that was formerly Chuck’s Steak House. Even today, this is somewhere you can plan to come for a good meal, thanks to the brewery’s in-house food vendor Gran- daddy Frank’s Barbecue, which sells “smoked meats and other family recipes.” Yee-haw! It’s a nice big space, with a real fireplace and a cozy vibe. I was one of only ten people here at 2 p.m. on a Wednesday, but it still felt homey and welcoming. There’s live music here every Saturday night at 6 p.m. Thursday night is big beef rib night, and the menu informed me that Cajun Night returns on Fridays in January. Clearly, this is a fun local spot to fill up. I ordered pulled pork mac and cheese with a side of coleslaw and, of course, some beer to wash it down. The brewery sells cans and growlers to go, and you can order pints and flights at the long, inviting wooden bar along one wall. I opted for a flight of four small pours. The food hit the spot, but I can’t say that these four beers impressed. The imperial IPA, nicknamed “One,” was solid, and the use of Citra hops gave it a nice zestiness, but overall I found it lacking in the kind of bright, nectar-y, three-dimensional flavor that can really showcase the hops. After a few sips, it was just too bitter for me. A peach-flavored Belgian ale, nicknamed “Two,” was also a puzzle. Aged in a chardonnay barrel, this beer has a slightly musty grape flavor, and the peach element, while a bit flat, tastes like real fruit and not candy. I couldn’t discern any Belgian yeast flavor, through, and the brew felt like a bit of a muddle. A seasonal beer called Humble Pie, which is half blonde ale and half cider, tastes like drinking the liquid run-off from an apple pie. I can’t say it’s terrible, but I wouldn’t order it twice. Thank goodness this one came with a cinnamon sugar rim, which at least added a little tastebud oomph to an otherwise thin blend. By comparison, the imperial red ale, called Big Red Barn, was quite good — malty, sweet, and strong. I easily marked it the best of the four. And Westfield River has more than a dozen beers on tap at any given time, so I’ll definitely plan on coming back and trying more. Back in the car, I headed to East Windsor, Connecticut, to Broad Brook Brewery. It’s located in the back of a large strip mall just off the highway, but thankfully the crew has hung a “Tap Room” sign outside, with a big arrow pointing to the correct door. Despite the strange surroundings, this place seems to have its dedicated set of locals. The seats at the bar in this high-ceilinged space were mostly filled when I arrived. Dozens of glass mugs, marked with numbers, hung overhead — evidence of a sizeable mug club made up of Broad Brook loyalists. Here I ordered another flight of four, and enjoyed the results. The porter here is a little on the sweet side, but balanced and perfectly satisfying. The Hopstillo IPA checks all the right boxes. The Jigawatts Double IPA packs a lot of punch, sweet and citrus-y at the same time. And the Homewrecker Holiday Ale (which is available only at the brewery during the holidays) is a not-too-spiced, malty brew that, at just under 7% ABV, will warm you right up. Late next summer, Broad Brook is moving out to a new building in Suffield, near the Bradley airport, which will have a bigger taproom, brick oven pizzas, and a three-season patio. It’ll certainly be worth a visit. But my favorite stop of the day was Cold Creek Brewery in Ellington, Connecticut, which I discovered via a beautiful drive down Route 140 through rolling hilly vistas, patches of woods, and old tobacco farmland. Cold Creek’s home, within a cluster of roll-up garage doors on Industrial Drive, doesn’t look like much from the outside. But the beer here shows great creativity and a steady, meticulous hand. There is nothing plain about Jane, Cold Creek’s American Pale Ale, which is juicy and robust — a perfect example of why the line between pale ale and IPA has nothing to do with flavor, and is barely a helpful delineation at all anymore. Adelaide, called a New England Pale Ale, is even hazier, thicker, and flavorful to the point of bursting. Natalie, the double IPA, is a real kick in the mouth at 8% ABV but still has a lot of nuance. 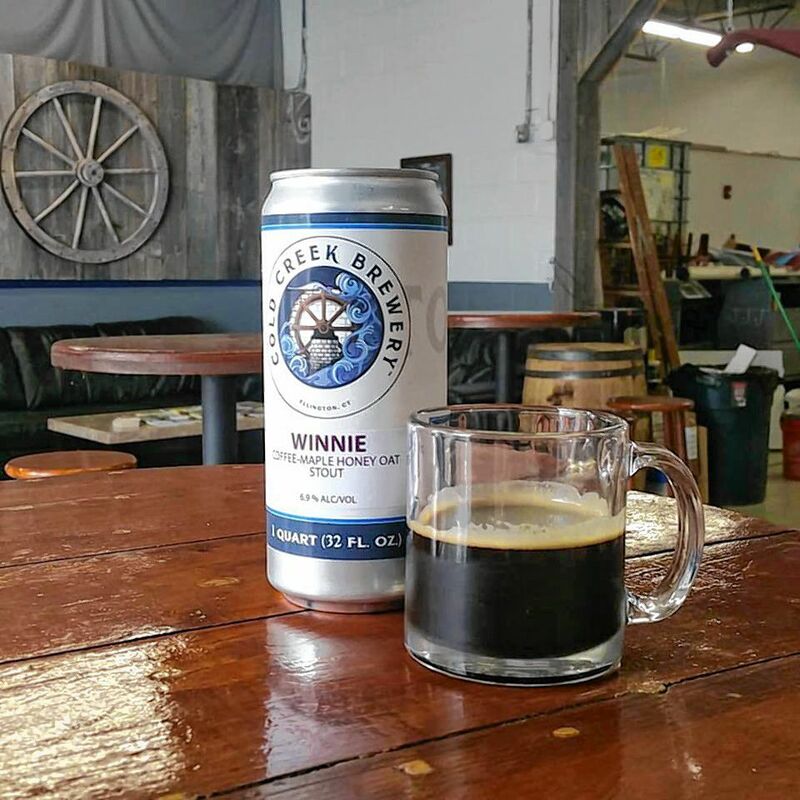 Winnie, a coffee maple honey oat stout, is more balanced than its complicated recipe suggests — smoky, toasty, roasty, a little bitter, seriously coffee-driven, and touched only lightly with honey. Gisele, the Gose-style sour, is quite tart and really good. And Annabelle, the German-style wheat beer, is just awesome, with a cloudy, golden body full of bright, full details. It’s nearly an hour from Northampton, but Cold Creek proves that good, easy day trips know no borders. The place may be a garage, but it’s clean and welcoming, with live music, ESPN, a mug club, an open invitation to dogs, and even a pizza hotline. Why stay at home when good finds lurk just a few minutes over the horizon?